One such group of veggies are those of the Brassica family; commonly known as cruciferous. These include broccoli, brussel sprouts, cabbage, cauliflower, kale, radish, rutabaga, turnip and even arugula. What makes this group of veggies so special? Sulforaphane. Sulforaphane is a phytochemical abundant in cruciferous vegetables, and it’s been getting a ton of attention from researchers. But it all starts with glucoraphanin. Sulforaphane is produced when the enzyme myrosinase converts glucoraphanin, a glucosinolate (natural compound found in some plants), through a chemical reaction induced by damage to the plant, such as cutting or chewing. As such, glucoraphanin is known as the precursor to sulforaphane. It just so happens that cruciferous vegetables contain a remarkable amount of glucoraphanin. Which makes them powerhouses of nature. Let me tell you why. There is a growing body of research into the wide array of applications for sulforaphane across the gamut of diseases and health issues. In fact, hundreds of studies have been carried out across the globe, since the first scientist, esteemed John Hopkins researcher Paul Talalay, realized this chemical’s potential in 1992. In this study, Talalay and his team explored and confirmed the anticarcinogenic properties of broccoli and sulforaphane. So excited was the world at large, his findings were even featured in the New York Times. Since then Tulalay has dedicated many more years to researching sulforaphane, going so far as to found the The Brassica Chemoprotection Laboratory (he’s still on staff at John Hopkins, though he’s pushing , no doubt helping inspire the continuing generations of scientists who want to know the truth about what plants and their compounds can do for the betterment of humanity. With that in mind, here are the top ten reasons to eat your cruciferous vegetables. Sulforaphane is increasingly referred to as an anticancer compound. This reputuation is linked mainly to sulforaphane’s potent antioxidant and antiflammatory properties, not dissimilar to turmeric (curcumin). In fact, one promising, albeit preclinical study found that the combination of sulforaphane, aspirin and curcumin was effective for the chemoprevention of pancreatic cancer. It doesn’t stop there, however. Sulforaphane has been studied for the prevention and treatment of several types of cancer, including stomach, bladder, breast, prostate, lung, colon and skin. Broccoli sprouts have been found to be as a rich source of antioxidants that improve the defensive system against oxidative stress in the human colon. In fact in a 2015 study, 57.33% reduction in oxidative DNA damage in NCM460 cells due to treatment with digested BS extract was observed. Combined Sulforaphane and selenium treatment enhanced protection against free radical-mediated cell death provided by the cotreatment. Inflammation has also been connected to depression, and a 2016 study found broccoli sprouts effective to “prevent or minimize the relapse by inflammation.” This same study found that the extracts of broccoli sprouts were so effective, they acted as a prophylactic that could “prevent the onset of LPS-induced depression-like behaviors” in the juvenile and adolescent mice they were testing, all the way into adulthood. [note: LPS (lipopolysaccharide) is a bacterially derived inflammatory factor known to cause a wide range of health issues]. More research is being done on the phytochemicals of cruciferous vegetables and depression. This is some evidence that sulforaphane may have significant value in pain, or pain management. A 2000 study on female fibromyalgia patients reported that the combination of ascorbigen (derived from Vitamin C) and broccoli powder “reduces pain sensitivity and improves quality of life” for patients suffering from this challenging condition. A 2016 publication also investigated the potential for sulforaphane via broccoli sprout extract, noting “significant” antinociception [pain blocking] results, that bode well for further study into the pain relieving benefits. Cardiovascular problems remain a top health concern, especially in the United States. CVD, cardiovascular disease, is on the rise, with Ischemia-Reperfusion (I/R) injury (such as myocardial infarction (“heart attack”), stroke, and peripheral vascular disease) and hypertension being main components. Research is showing that sulforaphane helps with inflammation of the arterial walls, inhibits obesity, relieves hypertension, and other conditions that are part of or lead to CVD. With regard to hypertension, a 2012 study reported sulforaphane “decreases renal and vascular oxidative stress and inflammation as well as blood pressure”, thus assisting in hypertension. r. Similarly, but even more significantly, a 2006 study demonstrated the power of eating foods high in sulforaphane by observing significantly “lower blood pressure and less tissue inflammation in adulthood, regardless of their subsequent diet” in the offspring of pregnant rats fed foods rich in the compound. Also of special note, a 2009 study in Iran in which rats were given an extract containing 2% of broccoli sprouts for ten days. “[T]he results show that a relatively short dietary treatment with broccoli sprouts can strongly protect the heart against oxidative stress and cell death caused by ischemia-reperfusion.” R Which is promising, indeed! Sulforaphane may also protect arteries from disease by boosting a natural defense mechanism in the body. It’s well known that cruciferous, especially broccoli, is a superior source of antioxidants. There are almost 300 studies on PubMed alone, referring to these vegetables and antioxidants. One particularly interesting study was carried out on young male smokers, in which 250g/day of broccoli was consumed, for a ten-day period. At the end of the treatment, of the many observations, decreases circulating CRP (C-reactive protein) concentrations were noted.] This is significant because the measure of CRP indicates the level of inflammation in a body, and indirectly the oxidative stress status, with high levels of both being associated with long-term diseases. In 2015 broccoli sprout extract was again found highly effective in reducing of oxidative stress, in this case being observed to assist with healthy liver function. There are so many toxic substances present in our lives. Too many! Cruciferous veggies and their sulforaphane rich tissues can help, as noted in several studies. In 2014, a randomized clinical trial recruited 291 participants from a rural area of China, an area known for high levels of air-pollution. The non-placebo group consumed a broccoli sprout-derived beverage providing daily doses of 600µmol glucoraphanin and 40 µmol sulforaphane over a 12-week period. [So essentially they were given a concentrated extract of cruciferous vegetables for three months.] Urine testing found “rapid and sustained, statistically significant” increases elimination of toxic substances in those drinking the beverage, over the placebo group. Studies have also shown sulforaphane assists in protection from and elimination of arsenic and pesticides. 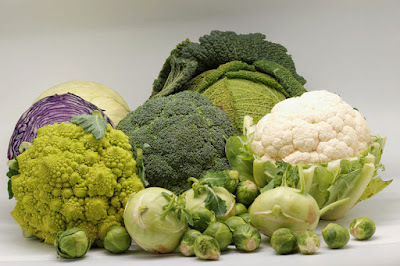 The detoxifying qualities of cruciferous is thought to be directly connected to sulforaphane’s role in activation of Nrf2, which is known to have a critical role in the metabolism and excretion of toxic substances. It’s generally recognized that diet and exercise can profoundly assist with the prevention and treatment of Type II Diabetes. However, specific positive results have been seen with regard to sulforaphane and consuming cruciferous vegetables. In particular, IR is an aspect of Type II that can cause havoc in a body. A 2016 study investigated the effects of broccoli sprout powder, containing high concentration of sulforaphane, on IR in Type II diabetic patients. In a randomized trial, 81 patients received either the high concentration of sulforaphane powder or a placebo, over four weeks. The end results gave clear indications of lowered levels of insulin resistance. Other studies have demonstrated similar results, showing decreased oxidative stress and IR and that “[s]ulforaphane could prevent nephropathy, diabetes-induced fibrosis, and vascular complications,” further empowering those with Type II Diabetes. While the sulforaphane had measurable, positive results during the testing, levels reverted to their original amounts at the end of the two months following cessation. This indicates that continued consumption of the broccoli sprouts would have continued benefits. Other research with sulforaphane rich sprouts reported 78% of patients showing negative stool antigen results after therapy, with 67% remaining negative another 35 days after stopping. Research with human gastric xenografts on mice reported the Helicobacter pylori “completely eradicated” in 73% of the sulforaphane-treated grafts. Studies suggest that sulforaphane might be a promising therapeutic agent for cognitive enhancement in Alzheimer's disease. In 2015, researchers looked at the effects of sulforaphane compounds via the administration of broccoli sprout juices of varying concentrations. They reported positive effects against the measures of two major factors implicated in the pathogenesis of AD, as well as upregulation in the intracellular glutathione content and the activity of antioxidant enzymes -- both of which may contribute to improved tissue detoxification and function. Dysfunctional inflammation has increasingly become identified to be a driving factor at the root of most, if not all, chronic illness and disease. In some form or another, somewhere, a body that is unwell, is inflamed. Luckily, nature has provided us with several remedies for this scourge of our times. As anti-inflammatories go, sulforaphane is right up there with that king of all spices, curcumin (turmeric) giving our cruciferous vegetables the upper hand in the list of healing foods. “[T]he consumption of broccoli sprouts modulated the excretion of biomarkers linked to inflammation and vascular reactions,” according to a 2015 study. More and more data suggests that sulforaphane may be useful as a therapeutic agent for the treatment of inflammatory conditions and diseases. This is not, by far, an exhaustive list of the known benefits of eating your cruciferous. Studies are even showing sulforaphane has benefits for autism, which reportedly affects around 2% of Americans (mostly males) and costs the US around $100 billion, annually. Seems they were right because in the resulting randomized, double blind, placebo controlled trial where they examined the effects of sulforaphane-rich broccoli sprout extract on autistic patients, they saw ‘dramatic’ improvement in 65% of those receiving it. These improvements diminished in the four weeks following the dosing period, solidifying the observed benefits of continued consumption. This just goes to show, the tremendous benefits of eating your sulforaphane-rich cruciferous vegetables should not be underestimated. Instead, take advantage of this bounty from nature by making them a regular part of your diet.